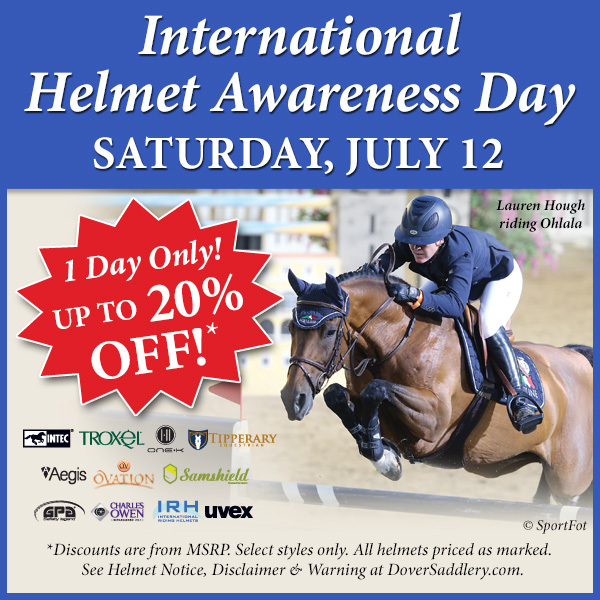 Today is International Helmet Awareness Day and to celebrate we are offering up to 20% off all our non-custom helmets! Your helmet is arguably the most important piece of riding apparel or tack you use, so make sure you are utilizing one every time you get on a horse. If you’ve been meaning to replace your aging helmet, dreaming of a new style with the latest technology, or ready to make your very first helmet purchase, today is the day for you! Closeout Alert! 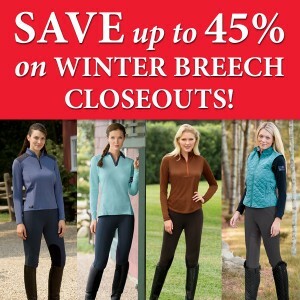 Save up to 45% on select Winter Breeches! Shop now! And don’t forget to check out our tips for buying winter riding breeches. Outerwear Closeout Specials: Jacket, Vests & MORE! Save up to 60% on our Outerwear Closeouts! Shop all! Call (800) 406-8204 with promotional code CM13D3DAY or click the link above to take advantage of this offer. *Orders leaving same day must be placed online by 1:00 PM EST, phone orders must be placed by 2:00 PM EST. Offer expires December 19, 2013. In stock items only. For orders up to 10 lbs, complete order in one carton. You will still be responsible for all regular and oversized shipping charges. Contiguous U.S. shipping addresses only. Not valid to PO, APO, FPO, HI, AK, PR, VI. Custom and Special Order items excluded. Not valid on previous orders. Please note that some rural areas will experience longer delivery times than noted. If you live in one of these areas, please call to confirm date. Not responsible for typographical errors. Cannot be combined with any other offer. FINAL DAYS! Receive a $15 Dover Saddlery Gift Certificate with Your $150 Order! * – Shop now! *To receive this offer, please click the above link, visit our retail stores or call toll free (800) 406-8204 and provide promotional code DSC003. Your $15 Gift Certificate will be mailed to you with your $150 or more order and can be redeemed on a future purchase. Limit 1 Gift Certificate per order. Not valid on previous purchases. Order must be placed by 11:59 PM ET., 12/24/13. Dover Saddlery Black Friday Sale – 2013! Our Black Friday Sale starts NOW! Save up to 60% + get $10 off your order of $75 or more! * Shop now! *Discounts are from MSRP. Pricing valid 11/29/13-12/01/13 until 11:59PM ET. Hurry, quantities are limited. To redeem this offer, please click the above link, visit our retail stores or call toll free (800) 406-8204 and provide promotional code CM13DTHANKS. Order must be placed by 11:59 PM ET., 12/01/13. Restrictions apply. Excludes Premier Products. Limit 1 coupon per household. Not valid on previous purchases. Limited time offer from Ariat! Shop the Ariat Collection Now! *Offer ends 12/30/13. 1 Ticketmaster redemption code per purchase. Maximum 10 Ticketmaster redemption codes per household. Subject to offer terms; click here for details. Get $10 OFF Your Order of $75 or More! Get $10 OFF Your Order of $75 or More! * Get an Early Start on Holiday Shopping. Click here to shop now! *To redeem this offer, please click the above link, visit our retail stores or call toll free (800) 406-8204 and provide promotional code CM13DTHANKS. Order must be placed by 11:59 PM ET., 12/01/13. Restrictions apply. Excludes Premier Products. Limit 1 coupon per household. Not valid on previous purchases. Receive a $10 Dover Gift Certificate when you open a new Wishlist account! Receive a $10 Dover Gift Certificate when you open a new Wishlist account! * Simply create, add to, and share your Wishlist to make it easy for friends and family to find the perfect equestrian gifts! Click here to create your Wishlist now! *Offer valid on new accounts only. Limit 1 gift certificate per household. Must provide full name and e-mail information to receive gift. Hurry! Offer expires 12/15/13. Mark Your Calendars! The 2013 Dover Saddlery Photo Contest starts Monday 9/16/13! – 1 Grand Prize Winner – $250 Dover Gift Certificate & their photo in the catalog! – 8 Category Winners – $100 Dover Gift Certificate! – 8 Runner-up Category Winners – $25 Dover Gift Certificate!